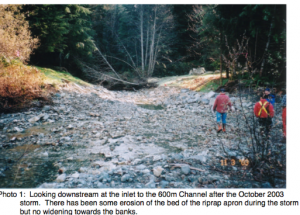 This report describes the Yookwa Creek portion of the restoration work completed in Nimpkish River watershed during the 2003 instream construction window after several years of study. The Nimpkish Watershed Restoration Plan, 2002-2006 developed by ALBY Systems Ltd. (2001) ranked Reach Y1 of Yookwa Creek the highest priority reach for restoration in the Nimpkish Watershed. This ranking was based on: Damage to fish habitats from channel widening as the result of fan and watershed harvesting, Low present fish use when compared to historic use, Prevention of future damage to high quality downstream fish habitat in the Sebalhall River and Nimpkish River as well as damage to the Nimpkish Island Ecological Reserve. There is aalso detailed set of coloured photos and maps available in the report. Link to PDF report: Nimpkish River 2003 Yookwa Creek construction report.